If ever there was the chance to ripen a Pomegrante in our climate this cultivar is the best bet. Large growing deciduous shrub for full hot sun and any well drained soil. Light to little summer water is necessary once established. Amenable to regular water as well. 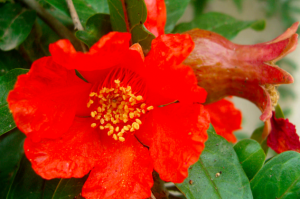 Beginning in June a continuous supply of red/vermillion/orange single flowers appear. If pollinated they will form fruit which would ordinarily (in a hot fall climate) ripen by October. In our much cooler climate it requires the hottest spot possible. Against a south facing wall would be ideal- for fruit to possibly ripen. Otherwise the large pomes with a blushed red outside are very ornamental. They can be left on the shrub or brought inside to dry where they will last for months in a dish. Very pretty. In autumn ‘Grenada’ turns a clear and luminous yellow before the small glossy leaves drop. Breaks dormancy late in spring- usually late April- be patient. Blooms on wood from the previous year- prune directly after flowering if needed. Avoid all shade. High deer resistance.